Although known predominantly for its Pennsylvania Dutch culture, the Gettysburg battlefield, and the cities of Harrisburg, Lancaster, and York, south-central Pennsylvania is home to many tracts of public lands that offer a diverse array of hiking experiences. From the gentle farm country of Lancaster and York Counties, to the steep-sided ravines along the Susquehanna River, to the rugged ridges no… rth of Harrisburg, and the rolling hills of South Mountain, you'll find hikes to suit about any taste and interest. 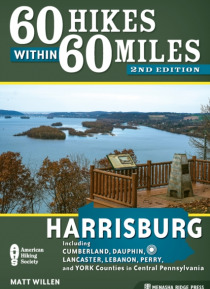 60 Hikes Within 60 Miles: Harrisburg, by local outdoorsman Matt Willen, provides the first and most comprehensive hiking guide to the region.Each hike description features key information on length, hiking time, difficulty, configuration, scenery, traffic, trail surface, and accessibility.This guide features information on the history and natural history of the areas the hikes pass through, detailed trail maps and elevation profiles, clear directions to the trailheads and trailhead GPS data, and tips on nearby activities.